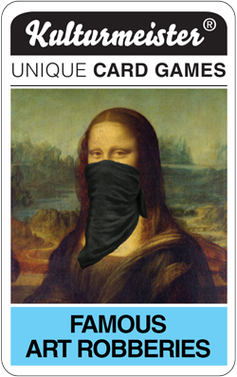 Fun, reasonably priced card game featuring spectacular real art heists. Earlier this month I got a twitter message from cuivreorargent showing me their wonderful Christmas present: an art heist card game! Famous Art Robberies! I coveted! I wanted! Kulturmeister, the maker of the deck, were kind enough to send me a set to review. When it came in the post I was so delighted that I clapped with joy…in the office…in front of my colleagues…as the decks tumbled to the floor. 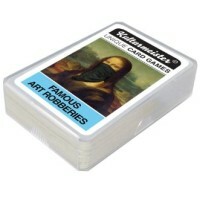 Even in the box, Famous Art Robberies looked great. They also sent me some stickers! Now obviously, to review this game I had to play it and to play it I needed at least one opponent to spar with. I turned to cone-spirator and known player of games, Gavin Doig. After we spent a few hours playing a video game where we both looted graves and restored bones to tombs (to get in the mood), we got out the Famous Art Robberies deck and got down to business. Game play is pretty easy: basic top trumps. You can play traditionally, you can make up your own rules, you can dig up variations, your choice. Modifying the game is important because as you start to memorise the relative merits of each card, the game will become automatic unless you shake things up. This is the case with any trumps deck and the internet is full of ideas for modification and variation if you can’t come up with your own. We had fun playing. Way fun in my case and plenty of fun in Gavin’s. For the record, Gavin crushed me. I’m not (too) ashamed to admit that. He’s going down next time. And that’s not all! 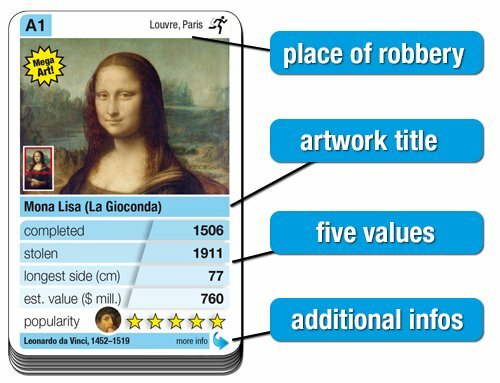 Flip each card over and there is a QR code that when scanned brings you to an informative article about the artist, the painting, and most importantly all the details of the art heist in question. There is even an iPhone app, but I haven’t tried it because I don’t have an iPhone. Note that the Mona Lisa (and only the Mona Lisa) is “Mega Art!” Love it! This is a great idea. When you’re done playing, read about the art, artists, and heists. 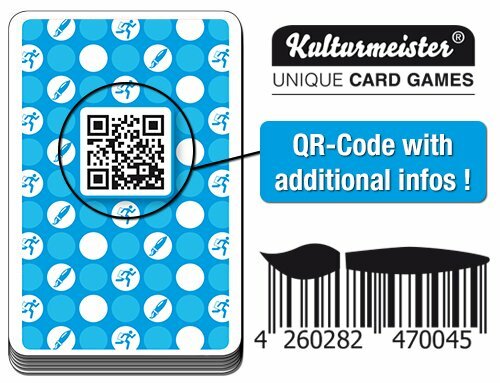 The makers of the cards are based in Berlin and the text of the decks was originally in German. Because of this, some of the English is a little stretched on the heist description website and in a few places on the cards. One particular English “oops” that we enjoyed was “Scottland” on Da Vinci’s Madonna of the Yarnwinder, being in Glasgow and all. The company might want to hire a native speaker to go over the written heist stories that accompany the cards (I have specialist students who’d take on that job btw), as it would just make the whole experience more slick. Really, this is a minor complaint. These small mistakes really are not a big deal, it’s all totally readable. 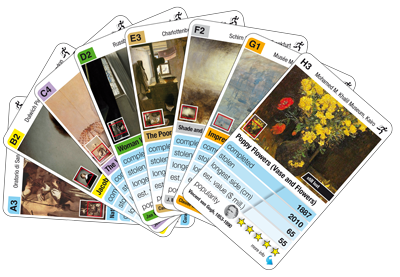 Fun, well made, well researched, great value for money: Famous Art Robberies is worth buying. I imagine they’d be great for older kids in a ‘sneaking some education in there’ sort of way, and it’s certainly fun for adults. These decks may become the standard gift I give to everyone. Pick one up yourself. One more thing. These decks are being distributed through museum shops. 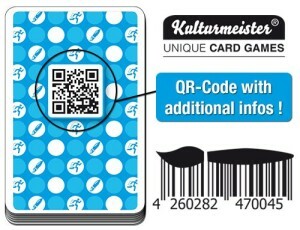 If you are in charge of one of those and you’d like to distribute, please do get in touch with Kulturmeister.